I’ve been in the mood for soup, the kind that warms your hands and your heart. Soup is a dish that always makes me think of home, which is odd since my mom wasn’t known for making soup. But it does make me think of comfort and care, the perfect dish to snuggle up to the fire with, what we turn to when we are recuperating from a dreadful cold. When I was a child I refused to eat breakfast food and my favorite thing to eat first thing in the morning was a packet of Lipton’s cream of chicken soup. I remember how excited I would get to see the steam coming out of the mug and I’d float little pieces of bread on top of the oily surface and then drown them with my spoon and slurp them up with a squeal of delight. 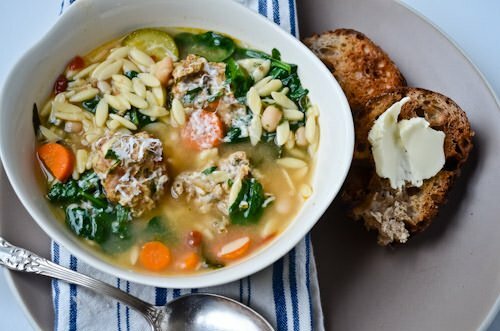 This soup fulfills my desire for a big bowl of home with tiny orzo pasta, big spicy meatballs and lots of greens to make me feel slightly virtuous. 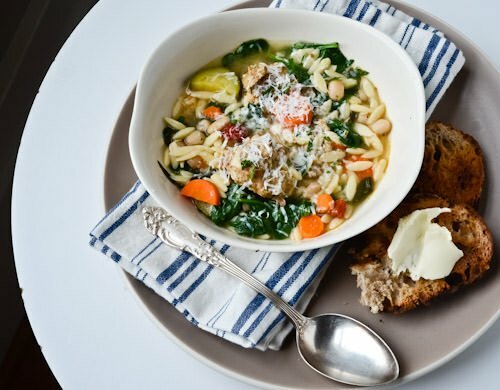 I adapted the recipe from the Barefoot Contessa and made a few modifications, based on what I had available and I added some zucchini and cannellini beans to up the fiber content. Happy eating! Combine the breadcrumbs and 3 tablespoons of milk in a medium bowl and let sit for 5 minutes to let the breadcrumbs soak up the liquid. 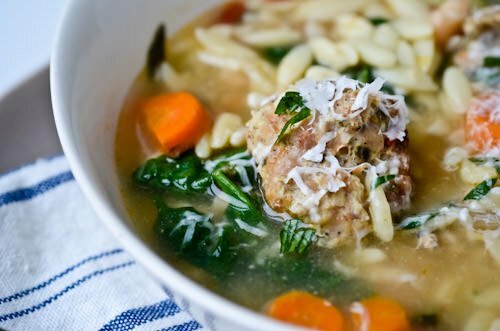 Add the sausage, garlic, parsley, red pepper, parmesan, egg, 1 teaspoon salt and 1/2 teaspoon pepper to the bowl and toss gently to combine. 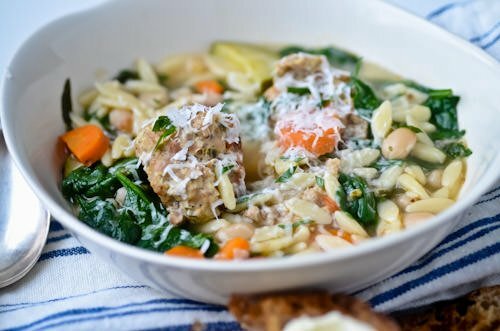 Shape the meatballs into roughly 40 1 1/4-inch meatballs and place on a sheet pan. Heat the olive oil over medium-low heat in a soup pot. Add the onion and carrot and saute until softened. Add the chicken stock and bring to a boil. 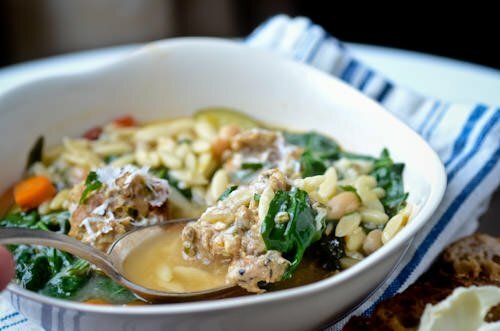 Drop the meatballs one at a time into the broth and let cook for 8-10 minutes and then add the pasta, beans and zucchini and cook for 9-10 minutes more until the pasta is tender and the meatballs are cooked through. Taste for salt and pepper and adjust as necessary. Add the spinach and cook for 1 minute, until the spinach is just wilted. Ladle the soup into bowls and top with additional cheese as desired.